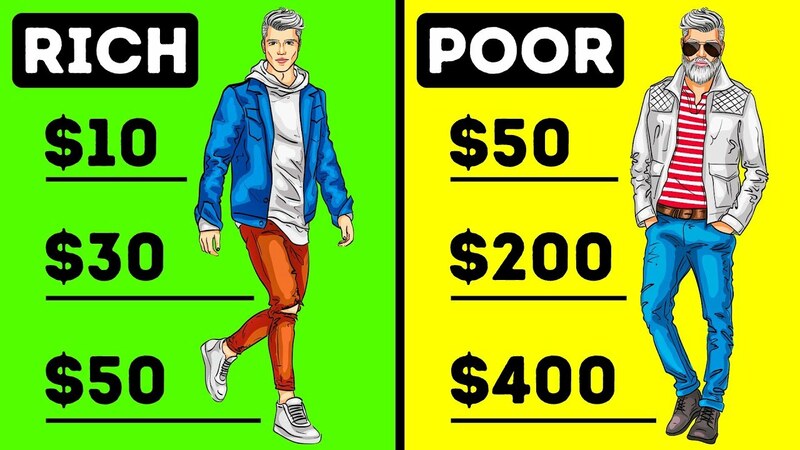 You're going to want to check this out seven differences between rich people and poor people. A major difference between rich people and those who have money problems can be found in the way they think act and see the world. #7 Rich people don't try to show off their wealth. Look at these guys, one of them is rich the other is poor. can you guess which one is poor and which one is rich? Well, you might think that the wealthy one is the guy wearing pants from a famous designer expensive jewelry and a haughty smirk right? Nope, this guy is just trying to look rich. But those who have money don't always flaunt their wealth. 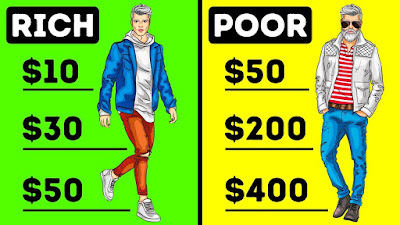 It may sound surprising but there's no real need to buy a pair of thousand-dollar jeans if you can find a high-quality product that's ten times cheaper. Wealthy people understand that and follow this strategy and this doesn't just apply to clothes. On top of that most rich people don't blindly follow the latest fashion trends or buy up new collections just because they're popular today. They realize that this isn't the best financial investment and even more importantly they don't feel the need to prove anything to anyone else. As for people with less money, some of them just like our guy are often eager to buy something that is trendy today. But at the same time, this product often costs a fortune. After such a purchase those who don't have the mentality of a rich person often have to save on buying food until they get their next paycheck. There's a lot of truth in this statement. "There are three kinds of people in the world. 1)The Have's 2)The Have-Not's and last 3)They Have Not Paid for What They Have's." #6. Rich people invest money in certain expensive items. While some rich people may pick cheaper though still high-quality clothes over trendy items at an exorbitant price, there are things they don't save on. Perhaps you love coffee, you can't live without drinking a cup or two a day. At the same time, you believe that a coffee machine is too expensive to purchase. Well, let's do some maths. You pay between $1.5 (100 rupees) and $3(210 rupees) for a cup of coffee? Okay, let's take $2.50(175 rupees) as the average price. If you buy at least one cup of coffee every day, this turns into about $1,000(67 thousand) per year. Oh, why didn't we figure this out earlier? At the same time a good coffee machine costs no more than $200-$400, isn't that an impressive difference. An induction stove costs twice as much as their electric fellows. But don't think that wealthy people only offer induction stoves to make their kitchen look cool. produced, goes into heating your food. As for electric stoves, their efficiency is only 70 percent, gas stoves are the least effective. Only 40 percent of their energy is spent on heating food. One more benefit of induction stoves is that your meal is ready more quickly and therefore less energy is consumed. Despite having many advantages LED light bulbs are still not that popular. The reason for this is their high cost. ordinary light bulb works for a maximum of 1,000 hours. An LED bulb has a service period of between 10,000 and 25,000 hours. This means that an LED light bulb is approximately 7 times more economical than an ordinary and cheap incandescent one. Most people prefer not to overpay by buying energy-saving glass. After all, a window with such glass costs 50% to 80% more than a window with regular glass. But there's one thing you should take into consideration before making your final choice. As for energy saving coating depending on its style, it can reduce the transfer of heat through the glass by 70 to 90 %. electricity used by air conditioners to cool your home when it's hot outside". At first, it might seem that the mechanism that regulates the temperature of the water with preset settings is an unnecessary extra. Surely you're capable of turning on the hot water and regulating it yourself. thermostatic shower faucet will start saving you money right away. You won't have to spend ages trying to get your preferred water temperature. In addition,you'll be able to turn off the water while you're lathering and it will be the right temperature when you turn it on again. Wow is this how rich people's brains work? but wait it gets even better. #5 Rich people make their money work for them while poor people work for their money. Both poor and rich people work hard to earn money. But rich people know how to make their money work for them. They don't keep their income and savings accounts. They have funds in their budget that they can invest and they do this regularly. much more at a later date. As for the less wealthy. They tend to spend all their money. This places them in a very unhappy vicious circle. "The more they earn the more they spend." They start working on the weekend and their life turns into a constant race of futile attempts to earn enough. #4 Rich people know how to manage their money. One more thing that makes most rich people stand out is their ability to manage money. "They know their budget they don't overspend." contrary often live in a world of credit-card bills. Most of them don't keep track of their money or plan a budget. They spend money and when it's all gone. They tend to use credit cards. #3 Rich people see opportunities while poor people see obstacles." Another thing that can differentiate the rich from the poor is the way they think. "Rich people see opportunities for growth and success in everything they do." The reasoning is "it will be a success because I will make it a success." They take responsibility for their actions and decisions and are ready to go to any lengths to achieve the desired results. As for poor people they usually focus on the obstacles, new beginnings may bring, potential losses and the risks they'll have to take. They are willing to overcome obstacles to achieve their goals. They realize that you can't win without taking risks. But they don't think about difficulties and losses they concentrate on their target and they get there. For people, on the contrary, try to avoid risks by all means. As they are afraid of losing their money. That's the reason why they might opt for such safe investments as savings accounts and deposits. But even if they don't lose their money this way, they also don't make it work for them. #1 Rich people face problems while poor people try to ignore problems until it's too late. This doesn't mean that wealthy people don't have any fears connected with their business. There's probably no human being on earth who is completely fearless. But rich people choose to face their fears to become a more successful and powerful individual. At the same time, poor people tend to avoid admitting that they have fears, even to themselves. They prefer their comfortable and familiar routine to facing something unknown and potentially risky. As a result, this prevents them from getting wealthy. "So in a nutshell, it's all about how you think that makes you rich or poor." Now, do you think you have the mentality of a rich or poor person! What could you do to become rich tell us in the comments below. Also, remember to subscribe to our blog so that we can make you happy with more informative and useful content.